I was more than excited the minute I came to know that my friend Swapna's recipe had been chosen as the month's recipe by the Sweet Punch team! I had wanted to try this when she posted the recipe but as always, never took the effort of making the same lazing out :). When the recipe was announced, I planned to make the dessert during Christmas, so that children would be around, but then with the cakes and cookies all flowing in I wasn't quite motivated. Moreover I had by hands unbelievably full during the hoildays. 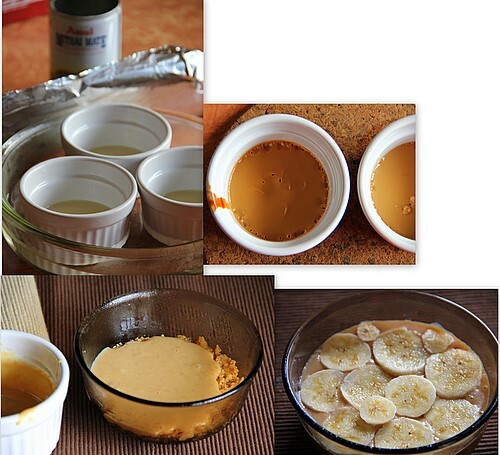 Finally I got ready with the ingredients and started whipping up the dessert 2 days back..
For the Dulce le Lechey, I adapted David Lebovitz's method as I felt to be more convenient and safe. Unfortunately my glass dish placed on the water bath on a pan didn't sit inside my small sized oven and I was forced to make it poured in individual ramekins made to sit in the glass dish made as the hot water bath, in turn. The Dulce was a bit over done for me as I left it more than the time mentioned, my carelessness :), and I diluted with a table spoon of warm milk and condensed milk to bring it to the right consistency. I forgot to add the salt as suggested but again it was fine. To make Dulce the Leche (pronounced dulchay the laychay), put the can of condensed milk, unopened, in a large pan, cover with water, bring to boiling point and boil for 3 hours, topping up with boiling water from a kettle as needed. Ensure that the can remains covered in water, as otherwise there is a risk of the can bursting open. Remove and leave to cool completely. You can make this ahead of time or even boil several tins at one go and store the unopened cans in the fridge for several months. This is the traditional way of making Dulce the Leche. Mix melted butter and powdered biscuit. Line a pie dish with this mixture and keep it in the fridge for some time. (For a crunchy biscuit base you can bake this for 10 minutes at 160 deg C. ). Chilling hardens the whipped cream. If you prefer such, have like wise! Though Swapna had been assuring about the irresistible taste, being a weight watcher, at least for the time being, I was worried counting the high calories contained in the dessert! Soon after the photography session I licked clean the spoon you see up in the first picture ;) and then was prompted to dig out more! two more..nah..three more and the bowl was packed off to the neighbourhood! If you need more feedback I would rate this as a rich, creamy, melt in the mouth dessert! 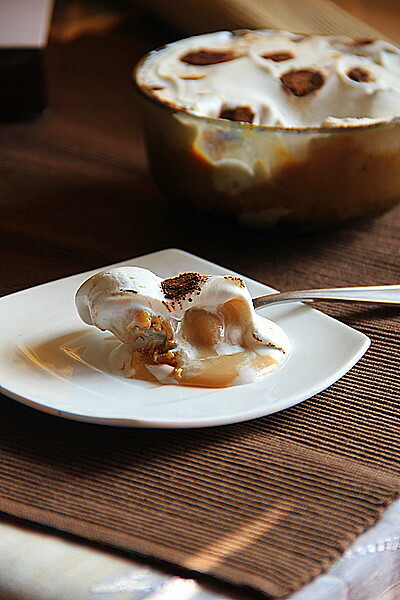 The caramel is not supposed to ooze out from the dessert as you see. I diluted the dulce a bit too much... the whole thing should stay firm as layers when sliced. For the full recipe, I prefer to use an increased amount; 600 gms of digestive biscuits for the base, but cut down butter to 75 gms :). I haven't made it yet, but this picture definitely tempts me to try it as soon as possible. One of my fav desserts , the bowl loos delectable. Can I grab the whole bowl? You are killing me with these clicks. Wow!!! 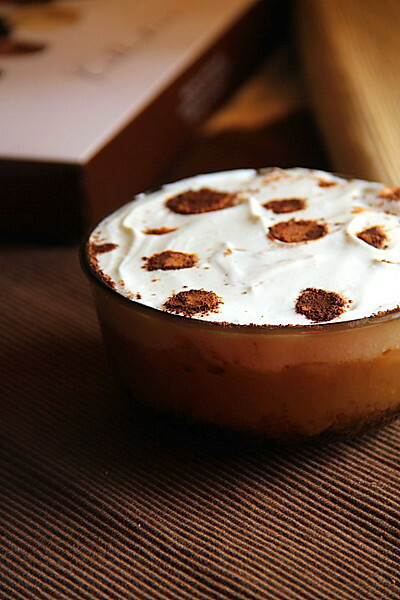 Feel like having some banoffee pie now. Yum! I loved it! The dessert looks simply yummy and mouthwatering. Super irresistible banoffee pie..well done and beautifully presented. 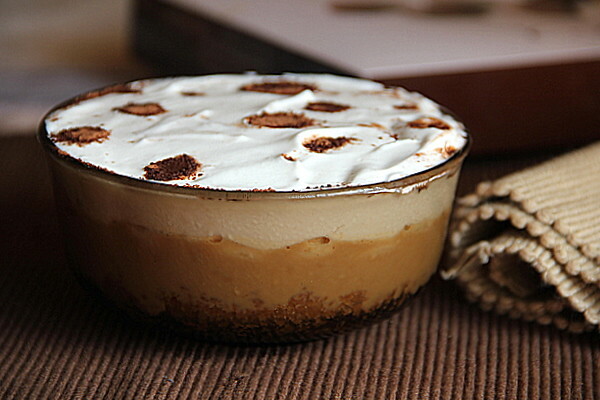 So this is what is exactly a banoffee pie..Seems so indulgent yet irresistable.. Thank you for trying this recipe and for the kind mention and link back dear! That has come out very very nicely. Even mine was little running and I couldn't get a perfect slice, but that was not because of dulce, but whipped cream. Love your topping. could you pass me the bowl pl? yumoo! beautifully made and very inviting! I make this with an oreo base - a double dose of chocolate..! Pictures are delicious..! I am hosting my first blog event plus giveaway – Valentines Special. Do check it out and be a part of it. Would be great..! excellent put up, very informative. I’m wondering why the opposite specialists of this sector do not realize this. You should continue your writing. I’m sure, you have a great readers’ base already! Looks so yummy...Thanks for sharing. Send yummy cakes to India online for Birthday, Anniversary, Fathers day, Mothers day and other occasions.